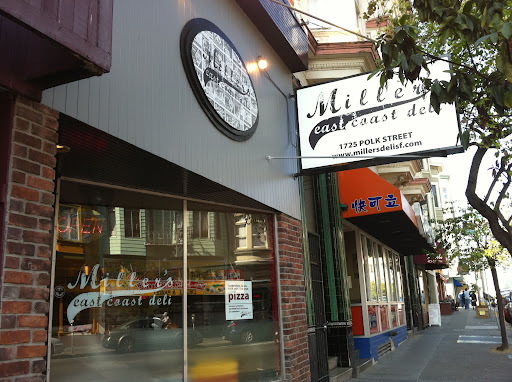 New York has Katz's and a hundred other delis, San Francisco has Miller's.﻿ The front of this deli serves take outs and orders of sliced meat. One noticeable thing about this corned beef sandwich are the slices are thinner than what you will find in New York. Actually I kinda prefer it this way. This sandwich keeps it simple with solid flavored corned beef between two slices of white bread. 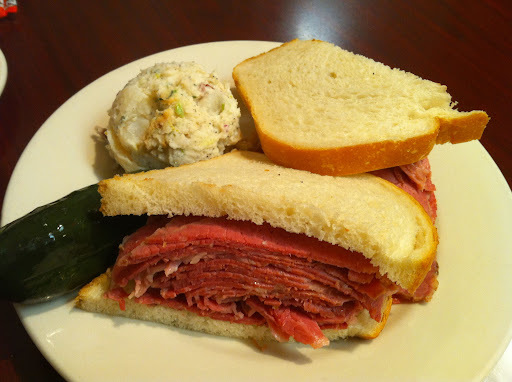 Normally I find that corned beef is too salty, but Miller's does it just right. Another yum for the potato salad and the housemade pickle. 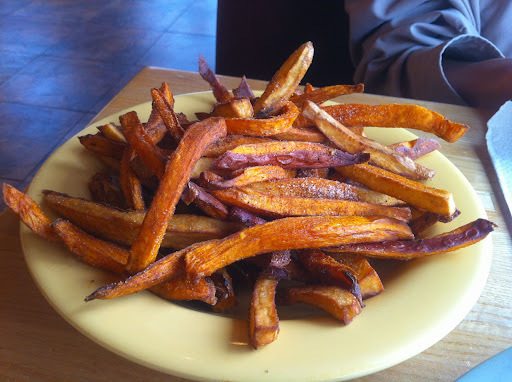 Sweet potato fries are one of those menu items I order everywhere I see it. This is the first time I've had the large cut sweet potato fries. I'm not a fan. The large size throws off the crispiness to potato ratio. 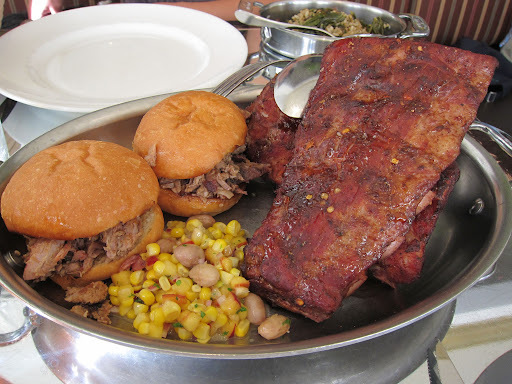 San Francisco is seriously lacking in good BBQ. Even Oakland has better BBQ options. Roadside BBQ may not be the greatest BBQ, but its passable if you're in the area. 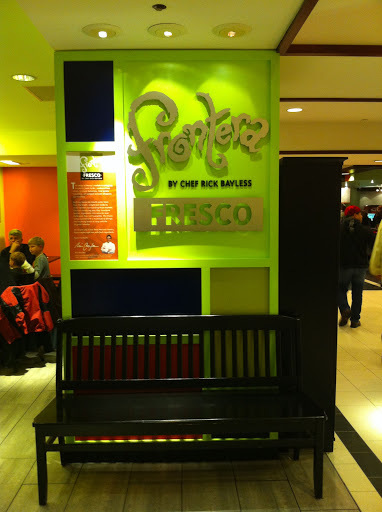 Chicago celebrity chef Rick Bayless decided to grace his presence for us on the west coast with Frontera Grill. 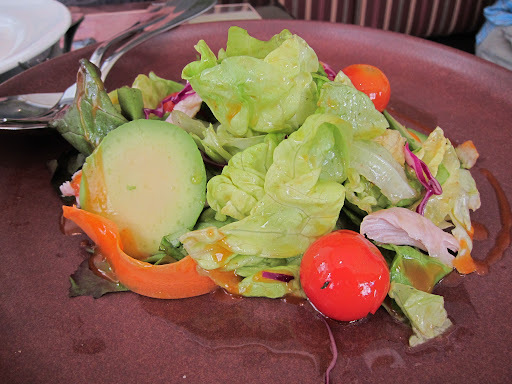 Two reasons I hesitated on trying this food spot: its mall food and prior to this opening, Rick Bayless has said that he is reluctant to open any restaurants outside the Chicago area because he wouldn't be able to control the quality. 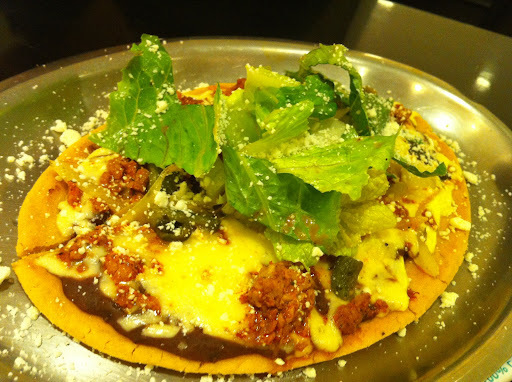 ﻿A grilled flatbread with layers of black beans, chipotle sauce, greens, Cotija cheese, Chichuachua cheese, chicken chorizo sausage, and roasted poblano peppers. This dish reminds me of a fancy Taco Bell tostada. Pretty bland. 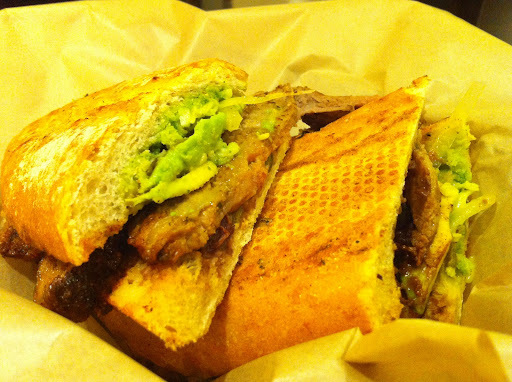 Chipotle-rubbed steak, Chihuahua cheese, cilantro chimichurri, poblano rajas, black beans, and avocado on grilled bread. Using the word steak on the menu item instead of carne asada should have signaled warning signs to me. The sandwich was bland considering all the tasty ingrediants that were listed on the menu. Frontera Fresco is probably better than the average mall food, but considering all the hype around Mexican food master Rick Bayless, this place severely disappoints. Nopalito is better. 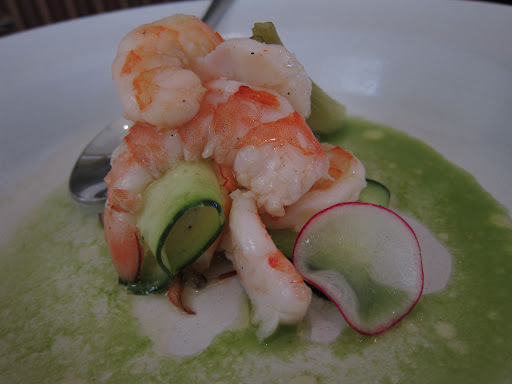 Check out my review of Nopalito- HERE. 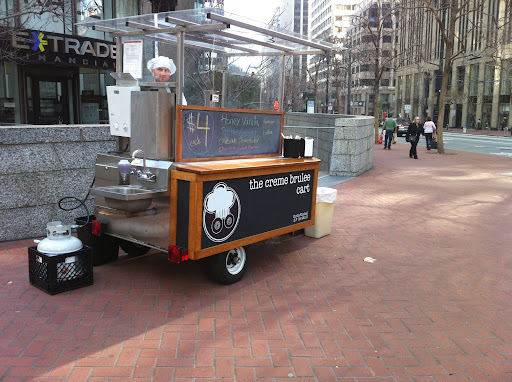 Sometimes the fun part of a food cart is accidentally stumbling upon one. 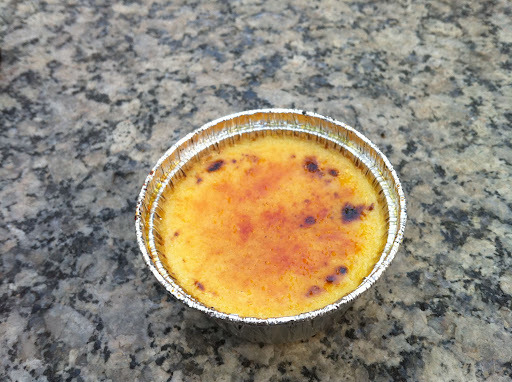 I've always wanted to try the creme brulee cart, but fate had never brought us together until now. These dainty desserts come in multiple flavors from chocolate to honey lavendar. Flamed upon order they are large enough to share. The vanilla bean was flecked with brown spots like a proper vanilla bean item should be. The custard is creamy and smooth with a crisp caramel shell. I'll venture anywhere to hunt down good food. This is an example. Not exactly in the best area (6th Street), but only 20 steps from Market St so I'd say still relatively safe. Also, it's right next door to famed chef Julia Child's loved Tu Lan. 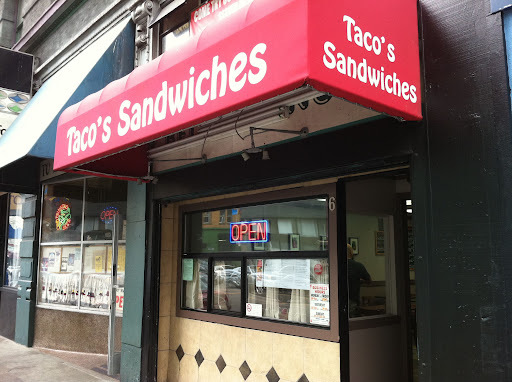 Taco's sandwiches is owed by a guy named Taco who sells sandwiches and no, he doesn't sell tacos. 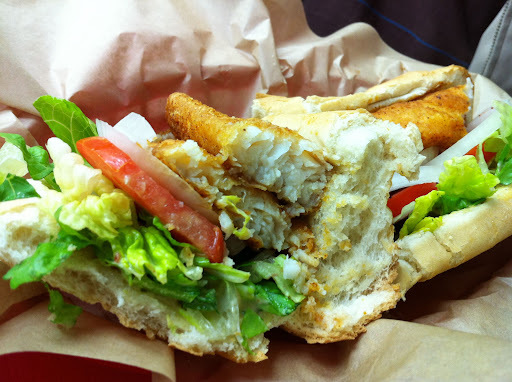 Cajun dusted filet of fish, chopped lettuce, tomatoes, onions, and chipotle aioli served with tartar sauce on the side. This sandwich is delicious. The fish is fried perfectly - no greasy aftertaste here. 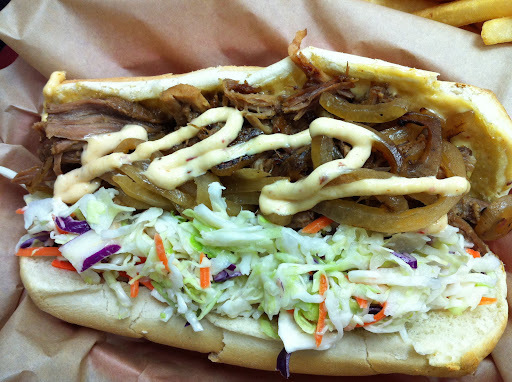 The pulled pork adbo consists of "slowly braised" marinated pork shoulder, homemade coleslaw and grilled onions topped with chipotle aioli. In a city of Korean tacos, and sushi burritos, of course there has to be a Filipino sandwich. 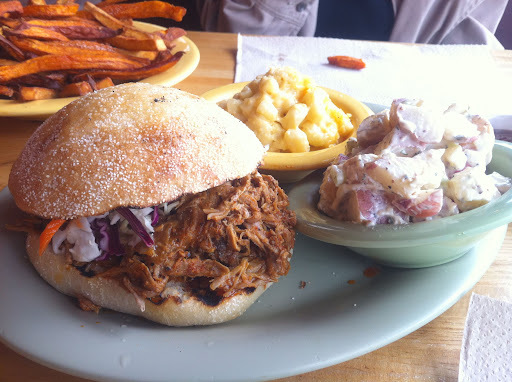 The meat is moist and tender giving it a contrast to the crispy, crunchy slaw. I wish he sold the coleslaw separately. It's hard for me to find a good coleslaw that I like this. This one is perfect -slightly sweet, crunchy, and not swimming in mayo. 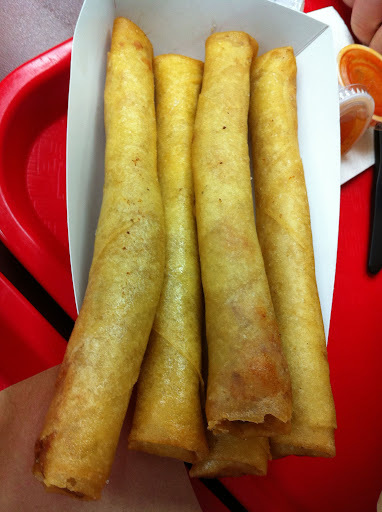 Taco offers a combo with lumpia with each sandwich for a little extra, but I opted to order a side of 5 pieces. Another perfectly fried item. 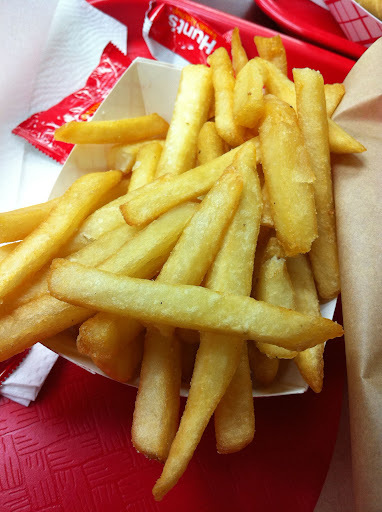 Fries came out hot and crispy. I don't think I've liked sandwiches this much since Ike's. 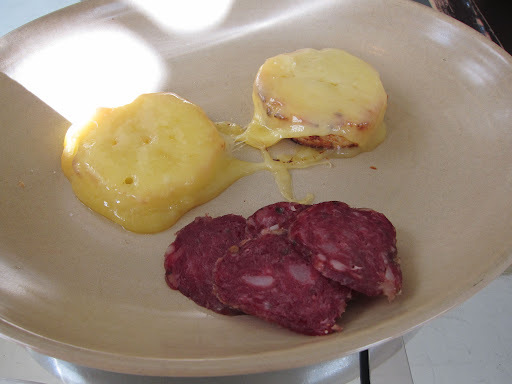 The portions are large enough to share and the prices are cheap. Unfortunately, Taco's sandwiches last day is Friday (9/30) due to lease issues. Hopefully he'll be back soon so I can try the other sandwiches. Random facts: Last day of business until futher notice is this week! ﻿ Bakesale Betty used to be this very small bakery in Oakland that sold pastries, pies, etc. Then years ago, they decided to sell a fried chicken sandwich. It became this huge must eat thing in the east bay. Almost cult status since it was only offered a certain day of the week. Fast forward to current day and this sandwich is now a regular item with an assembly line process. Order is fast and efficent since majority of people in this huge line are here for the sandwich. So don't fret about the length of the line when you walk by, you won't wait that long. Iron boards are set up to use as tables along this block and you can see them filled with people eating this sandwich. 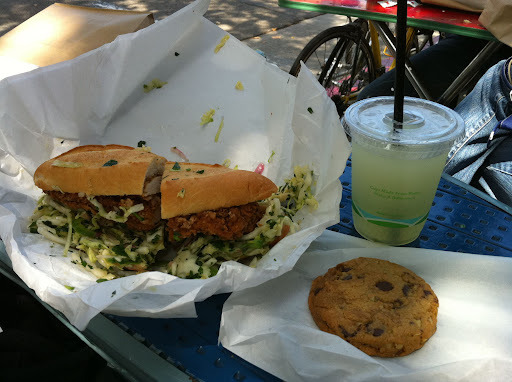 The infamous fried chicken sandwich with jalapeno slaw. 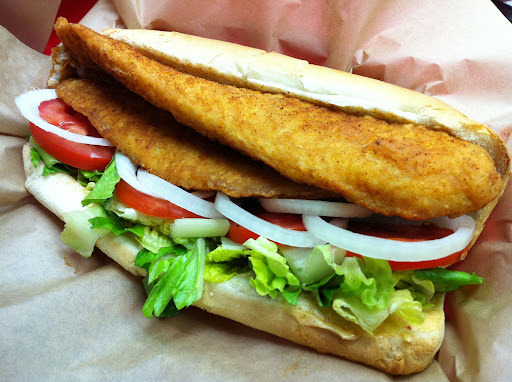 A negative to this quick production line sandwich is the room temperature, even sometimes cold, breaded chicken. 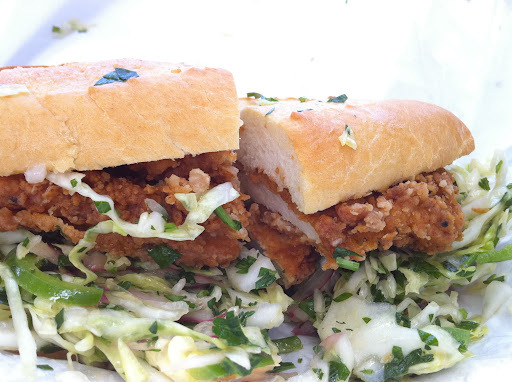 The best thing about this sandwich is the jalapeno slaw. The crispy and crunchy texture gives this dry chicken sandwich an upside. Don't worry even though this slaw is speckled with jalapeno slices, its not spicy at all. Next time I think I'll just get the strawberry shortcake and pass on the sandwich. 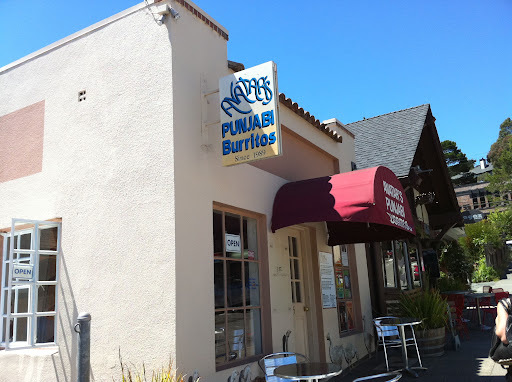 The predecessor of Curry Up Now located in the sleepy downtown of Mill Valley. A must order whenever ordering Indian food on a nice day. 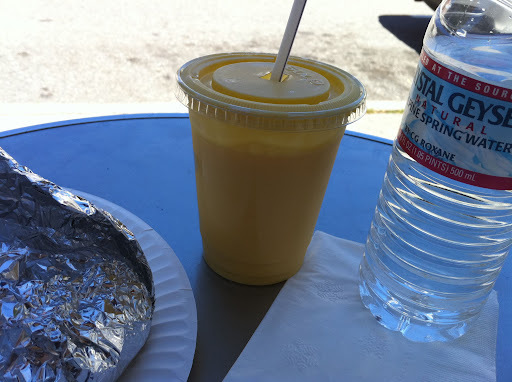 The coolness of the lassi always compliments the spiciness of Indian food. 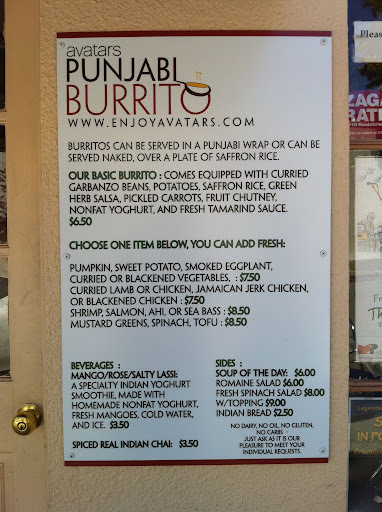 I ordered the pumpkin burrito having heard that it was the most popular item here. 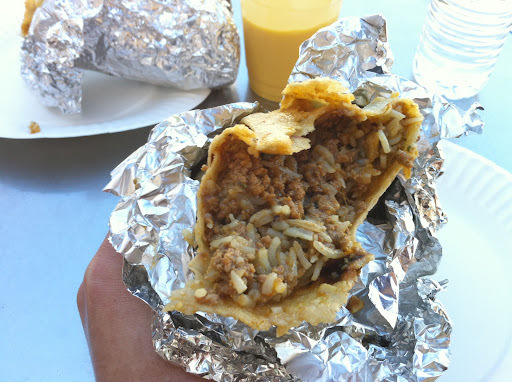 The burrito is wrapped in either a thicker tortilla or a really thin naan - I can't figure it out. Probably one of the worst wrapped burritos I've seen in my life (pet peeve of mine). You can see even in the picture it can barely stand on its on and the filling is oozing out. This burrito feature irked me while I was eating it since I had to constantly keep eating the part that was falling out to keep everything from spilling out. 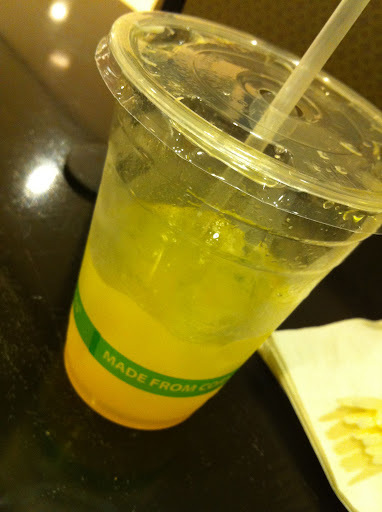 The pumpkin provides a sweeter taste than what Im normally used to. Not very spicy either. Definite downer here. Decided on another burrito in hopes that at least there would be a 50% win here. I also thought that the lamb would give the burrito more substance so it wouldn't be as mushy. No such luck. 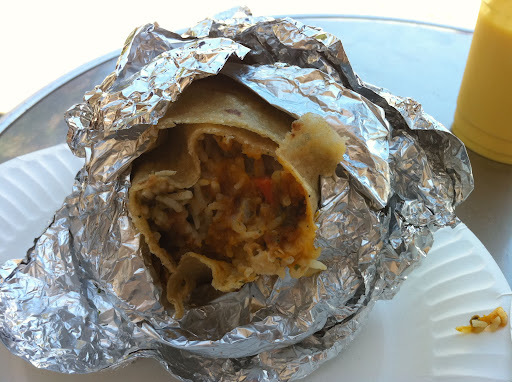 Same gripes as with the pumpkin burrito - a little bland, mushy, and hard to eat. This burrito was probably a tiny bit better than the pumpkin burrito, but absolutely not worth driving across the bridge for. ﻿ The ordering process can be a little confusing if you're a first timer here. Ordering and paying are in one line then as your items are called you pick up at the appropriate sections. If you don't get it, don't worry, the workers behind the counter will direct you and help you get what you ordered. 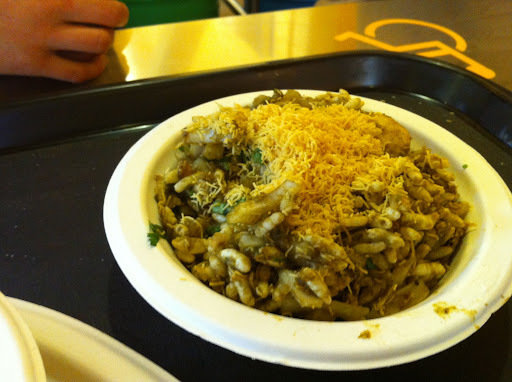 ﻿ This bhel puri is made of puffed rice, tamarind sauce, and sev (fried snack shaped like thin noodles made from besan flour). It is important to eat this dish as soon as you get it because the puffed rice will soon get soggy. 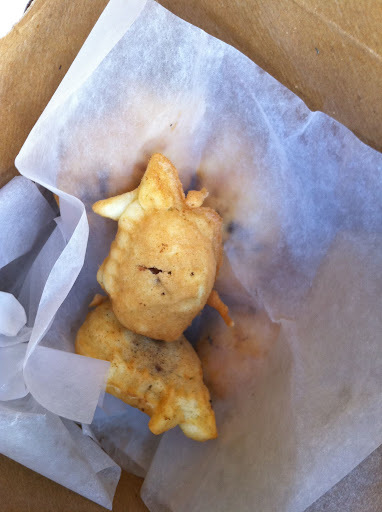 ﻿ Samosas are deep fried curried potato stuffed pastry. This one is served with chole (chickpeas). One of my regular items. 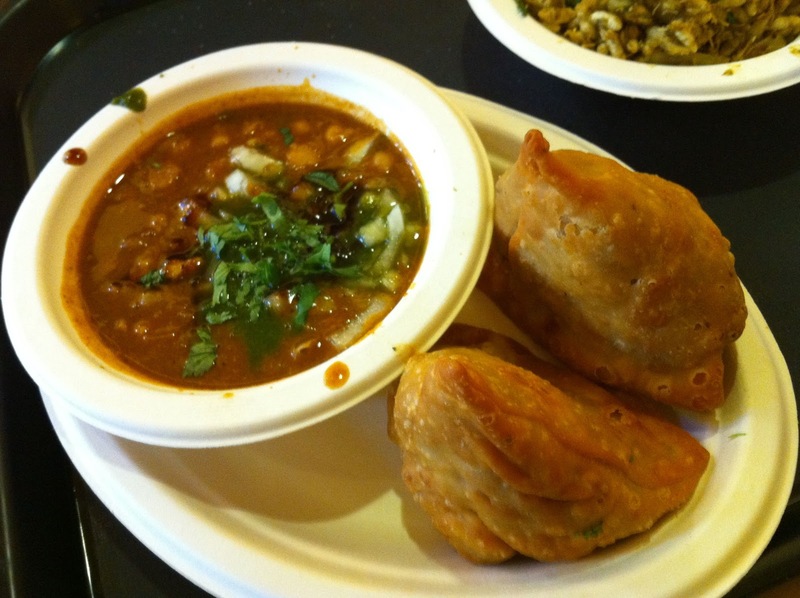 Samosas are Chaat 101. Bhatura chole is present at almost every table here. 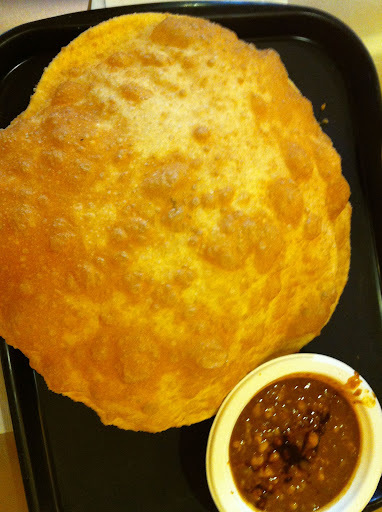 Bhatura -Indian puffy deep fried dough. Careful when pulling this apart. The hot air steams out when you rip it - only newbies burn themselves eating it. 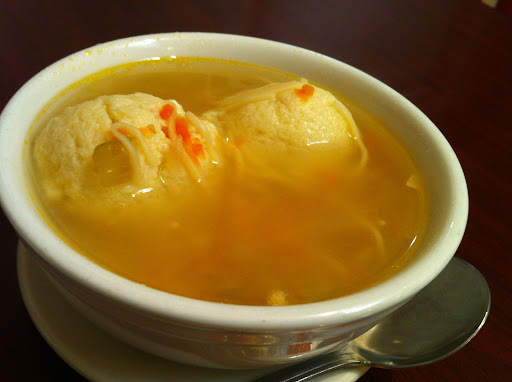 Served with chole (spicy chickpeas). Perfect amount of spiciness. Chaat is up there with my favorite things to eat. Vik's is a great place to go with friends and order multiple dishes. 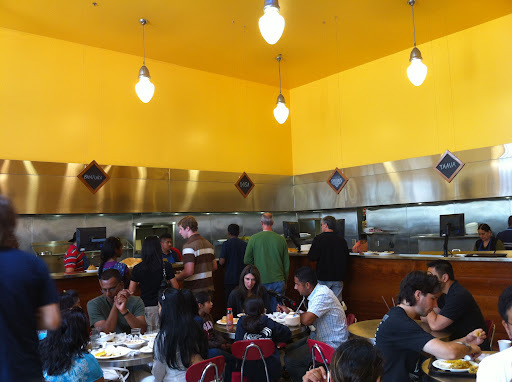 The high turnover of this place ensures that you get things hot and fresh which is vital for chaat. 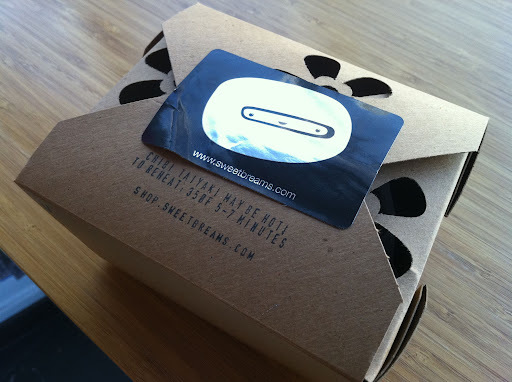 Even the packaging is cute! These flavor filled fishes are made to order. 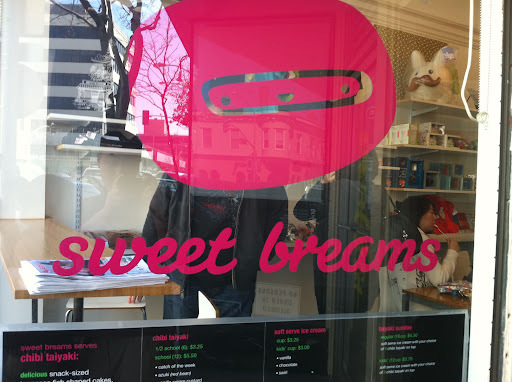 Traditionally taiyakis are stuffed with azuki (red bean), but Sweet Breams offers vanilla, chocolate﻿, and nutella. Check their website for the flavor of the week. 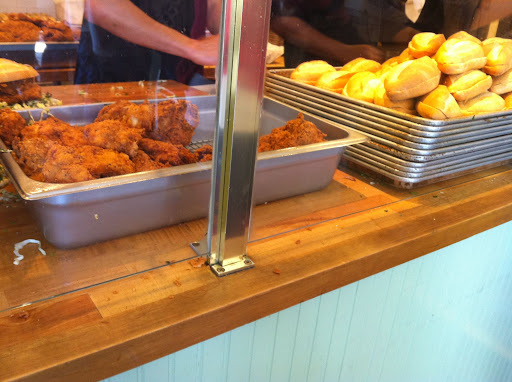 They do offer occasional savory flavors such as Chicken & Waffles and Jalapeno Popper. The adorable and playful approach to this Japanese sweet snack is both delicious and fun to eat. Its been hot in the city these past couple nights to the point where its been unbearable to sleep at night. The best remedy - ice cream. 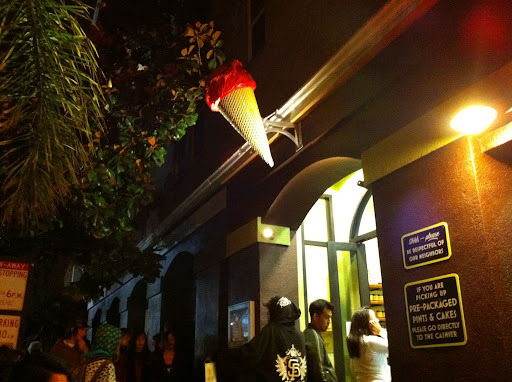 Bi-Rite Creamery opens late so I can always pop over for a quick treat. I've always wanted to try the Sam's Sundae, but I'm too attached to my Salted Caramel ice cream. A unique take on a traditional ice cream sundae, Sam's Sundae ( I think it was named after the worker who invented it) has a drizzle olive oil on top of their house made chocolate ice cream. If you look closer at the picture you can see little sprinkles of maldon sea salt. Weird? Maybe. Delicious? Yes. 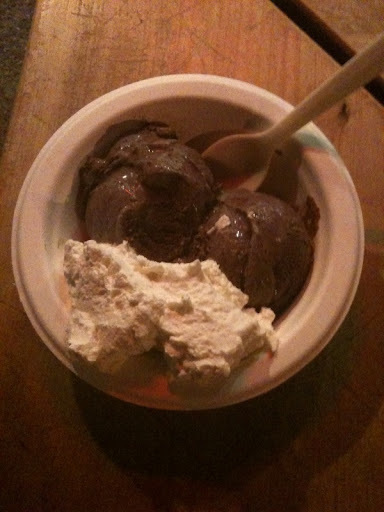 Bi-Rite has the reputation of having velvety and creamy ice cream - the chocolate flavor is no exception. The syrupy olive oil enhances the richness of the chocolate. Each sea salt flecked bite makes your taste buds confused then thirst for more. I saw this in the Franfurt airport in Germany. Jack and coke already prepackage in a nice convenient can. Genius! 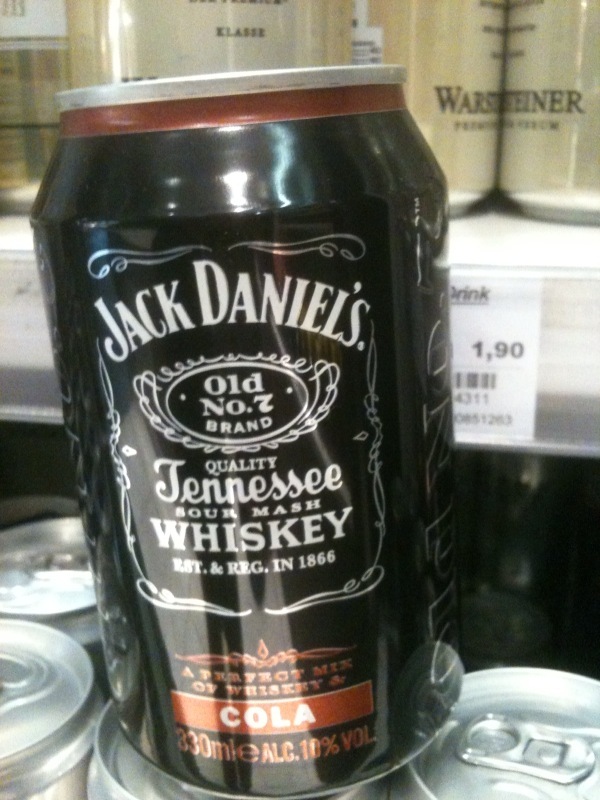 Why don't we have this in the States? One of my favorite restaurants in northern California. 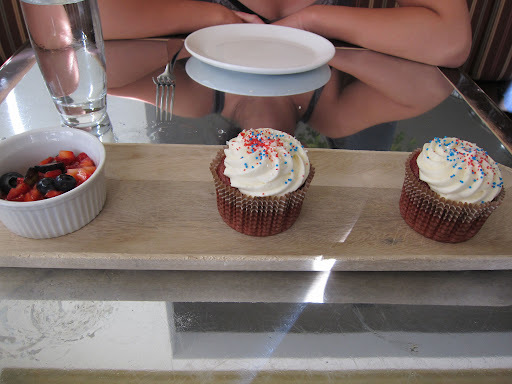 Unfortunately, this meal was probably the most disappointing of all my visits. The BBQ ribs was a dry rub with a sweet taste, not really my preference. Also the ribs were a little dry. 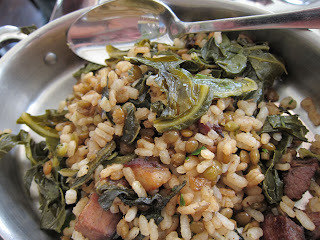 The side of rice was probably the highlight of the meal. I'm constantly on the search for an izakaya similar to what I've experienced and tasted in Japan. This one does have many authentic items, but the skewers don't come out hot enough. Also the chicken is a little dry. Overall its a decent spot that isn't too expensive. 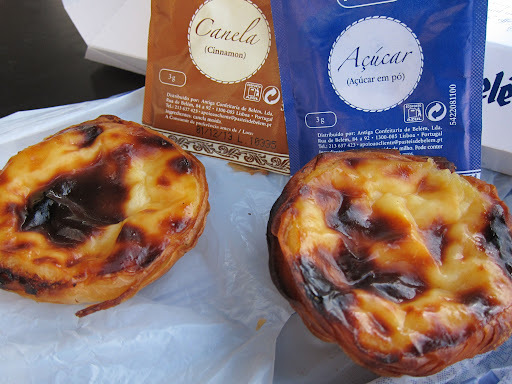 I was only in Lisbon for less than 2 days, but eating these custard tarts were on my to do list while I was there. 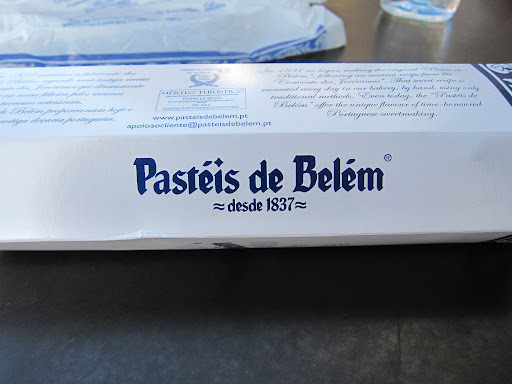 If you opt to stay in the Barrio/Chiado district, like I did, you will have to take a train to the Belem district to snack on these. 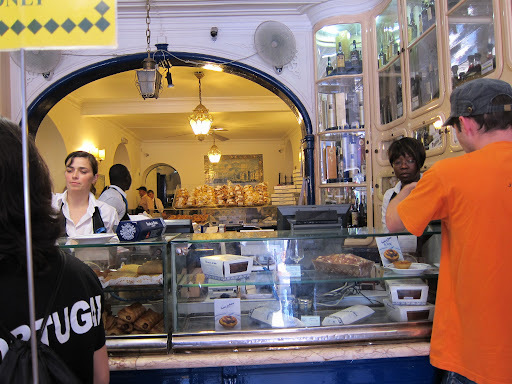 You can either walk into the cafe and eat in or take them to go. I chose to take a box of 6 and eat them outside (at the tables in the Starbucks next door). 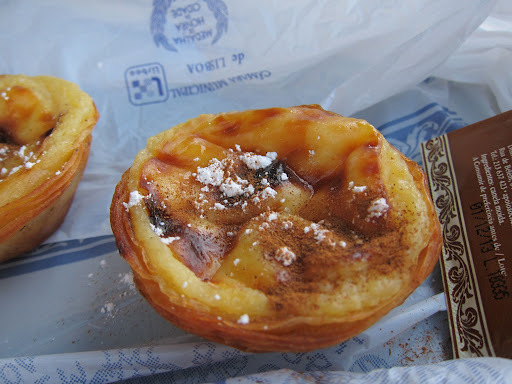 The custard tarts were warm and soft with a crispy crust. Similar in taste to a Chinese custard tart with a different tart shell. Chinese tarts have a flakey pastry crust - this one had a crisp flakey crust. These tarts are bagged up with packets of cinnamon and sugar to be sprinkled on before you bite into them. Absolutely delicious and addicting. The size is reasonably guilt free so you could eat a couple in one sitting. Verdict: Definitely as good as they say. 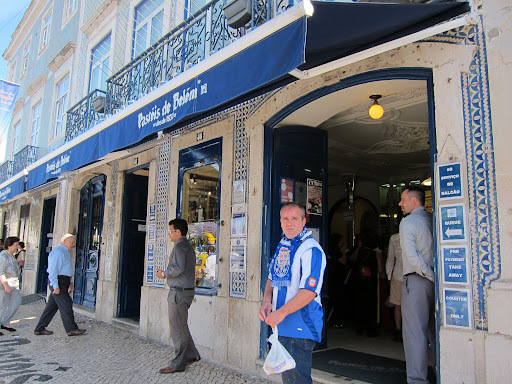 Stop by when you are in Lisbon.